Salvador Dali was a Spanish Surrealist painter who lived from 1904 to 1989. If you’ve seen paintings where the world doesn’t quite seem to make sense, and everyone and everything seems twisted and dreamlike, it probably owes some credit to Dali. He was a prominent figure in the Surrealist scene in the early 20th century. Dali’s style is incredibly distinctive and unique; it’s really easy to look at a painting and know that it’s his. But this quote gets to the heart of something fundamental about distinctive artists: they learned from imitation! Dali had to start somewhere, and while in school, that somewhere was Cubism. He fell in love with the style and learned as much as he could from catalogs because there were no significant Cubist artists in Madrid, where he was studying. Dali was also a master of Realist techniques, and painted very detailed still lives early on. But learning how to imitate and mastering other styles gave him the tools he needed to make his unique brand of painting. If you look at his famous works, that Realist technique is very present in the details of his paintings, but you can see the influence of things like Cubism and Dada (an absurdist artistic movement) dictating the way he sees the world. By imitating these other styles in building his technique, he gave himself everything he would need to make his work his own. Michelangelo is one of the most recognizable artists in the world, and not just because there’s a Ninja Turtle named after him. He painted the beautiful Sistine Chapel ceiling and was an incredible sculptor. But all of his fantastic work came with a price, that people tend to forget: practice! Michelangelo worked hard, every day, to fine tune his skills, and become the great Renaissance artist we all know today. He knew how important it was to practice, to experiment, and to do and re-do until the his end result seemed effortless. The author Malcolm Gladwell argues in his book Outliers: The Story of Success that it takes 10,000 hours of practice at a given skill to become a master of it. That it isn’t innate genius that separates out the people who we look up to, but the environment and the time that they put in. Remember when you see something that looks flawless, that there’s only time separating it from you. Coming back to Dali, this is another crucial sentiment; People get scared of perfection. The idea of making something that’s not quite perfect makes lots of artists stop before they ever get going. Have you ever had a Pinterest fail? One of those moments where you see an example or a finished product and know that what you’ve got doesn’t even look close to what it was “supposed” to be? Well good! Learning from those mistakes is how you improve, and how you get closer to making something the way that you want it. But I can guarantee you that the person who put up that “perfect” example can look their work over and find something that upsets them about it. For every person who is suddenly struck with a bolt of inspiration that makes them turn to their work desk or canvas or notebook, there are a hundred more telling themselves that they need to wait for that inspiration before they do anything. The only difference between the first group and the second one is that the people who got inspired and did something about it had probably already planned to go to their workspace that day, and just got a pleasant surprise. People get ideas all the time, ones that pop into your head and drop out of it just as quickly. There’s nothing special about that. But if you’re putting in the time to practice, racking up those hours and not worrying about whether things are perfect or not, then every once in a while, one of those ideas will catch you at just the right moment. It’ll be something brand new, that you’ve built up the foundations to make, and that you can translate from brain to hands because you’ve imitated and practiced similar projects again and again. Lots of people reduce inspiration to waiting for “The right time” and forget that they need to be in “The right place” for that moment to mean anything! Finally, we have a quote from Akira Yoshizawa, a man considered to be the father of modern origami technique. He pioneered lots of techniques in paper folding and created lots of unique figures that seemed almost alive. Yoshizawa’s work was foundational for papercraft and origami in the 20th century. So remember, keep making art! 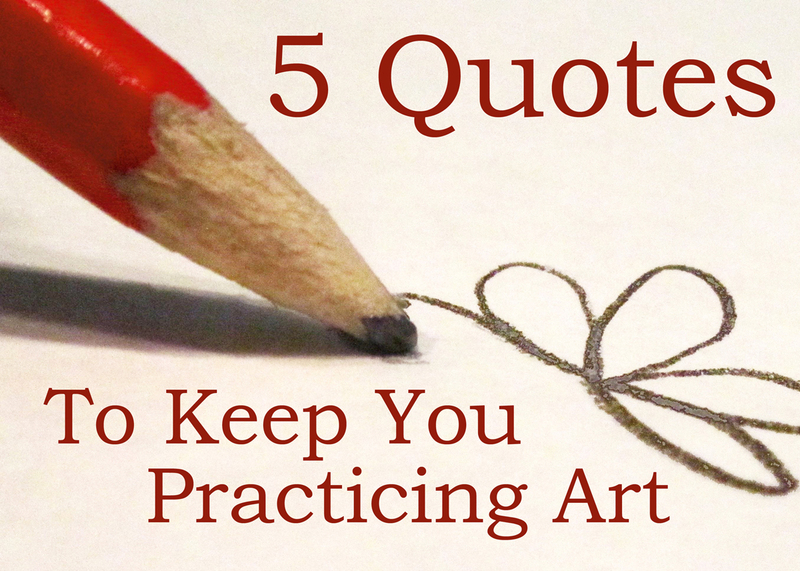 Use art quotes to help you. Don’t feel discouraged or stop because you don’t feel like you’re where you’re supposed to be. If you keep working at it and find joy in the act, you’ll completely shock yourself with what you’re capable of!